Artur Phleps born in Biertan (Berethalom, Birthälm), a village in Southern Transylvania, part of the Austro-Hungarian Monarchy, on November 29, 1881. Belong from a Volksdeutsche family; his father was a doctor and his mother a farmer’s daughter. Started his military career in the Austro-Hungarian Army, Phleps served as a mountain trooper during WW I and ended the War as a first lieutenant. He raised a national guard in 1918 in his native Transylvania to fight Bela Kun’s Hungarian Communists. Finding that he could this better in the company of the Romanians who had advanced on Budapest, Phleps took service in the Romanian army and played a prominent part in the modernization of the army. After served as an instructor at the Military Academy in Bucharest, Phleps was promoted to the rank of general and with the versatility of some hero of the thirty years war he commanded the Mountain Corps until he was put into reserve in 1940. In 1941, Phleps asked to be retired from the Romanian army and moved to Germany. Then he volunteered in the Waffen-SS, where he received the rank of SS-Standartenführer and served as a supernumerary officer on the ‘Wiking’ divisional staff. He was eventually given command of the ‘Westland’ Regiment, where his performance attracted his Army superior, General von Mackensen, who persuaded him to join the German Army and promised him to lead a division. However, Himmler intervened, promoted Phleps to SS-Gruppenführer and entrusted him to form and lead a new Waffen-SS division, known later as 7.SS-Freiwilligen Gebirgs Division ‘Prinz Eugen’. Like Phleps himself, the division consisted mainly of Volksdeutsche volunteers from Hungary, Romania and Yugoslavia. Organized as a mountain division and armed with captured French, Czech and Yugoslav weapons, ‘Prinz Eugen’ served throughout the war in Yugoslavia conducting anti-partisan operation with great brutality. 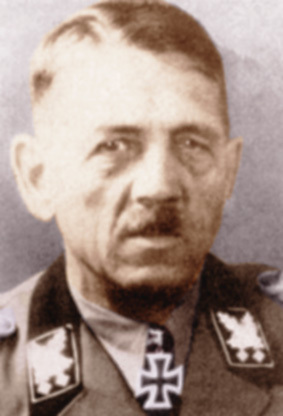 Phleps himself was to be decorated with the Knight’s Cross on 4 July 1943 for his leadership of the division and subsequently promoted to SS-Obergruppenführer and got a command of the V.SS-Gerbirgskorps. The end of Artur Phleps, who entered the SS as a Romanian general, was as ambiguous as his career. In September 1944, when most of the Hungarian army commanders were on the point of surrendering to the Red Army, he was flown from Montenegro to form a front in Transylvania, the home of his boyhood. Two days after Phleps had left Budapest, Himmler ordered his arrest. He had been accused by the SD of defeatism, but he never found: Phleps was captured close to Arad by Soviet troops, on 21 September and was summarily executed by his Soviet guards the very same day. His body was never found but his Knight’s Cross and some of his uniform insignia were eventually recovered and accepted as evidence of his death. On 24 November 1944, the Oak Leaves to the Knight’s Cross were posthumously bestowed upon Artur Phleps. As a further honor, a mountain regiment of the ‘Prinz Eugen’ Division was named ‘Artur Phleps’ and granted the privilege of wearing a cuff band with his name.